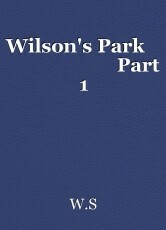 This is a Short story about a Very special park and the happenings of two very special people on a very special day Booker And Ellie are more than soul mates the happenings are more than romance more than what anyone can comprehend Join them Find Out if it is love choice or fait that has brought them together. Wilson Park in New York Thought of by people who visit as bliss Surprisenly peaceful quiet place thriving with nature and the loving memories of family's who share some of the best memories, The Green Well nurtured grass of Wilson Park is Unique it is better in some magical way than any other park has a loving touch, the gates embrace your entry with open arms The paths lead you to Beauty N wonder, It is said the Flowers are so perfect In wilson Park Because of how much love is created in the park as if the love was just as important as how much sunlight it recives or how many bee's attend to the flowers, There is a park of the park that is famous on veltines day houndreds of roses grow and round this bronze styled medium sized statue of Wilson and Mary Anne in the place where the founders of the park shared there first kiss the roses only grow in that earea no where else another place with a touch of magic left behind be Wilson and Merry Anne. The park is surrounded by big Oak Tree's perfecly coloured the perfect canvas for an artist, The wonder of New York was About to be a the birth of something Truly Amazing and unique More unique than the love of Wilson and Merry Anne. Booker Ryans a Young succesful Watch Designer owner of 2 stores in New York, Booker daily routine is ordinary and usual yet so special to him. He wakes up in is luxury custom apartment in central New York Close to his Store's his routine containes waking up at 8:30am,rushes teeth, makes a healthy Smoothie,Works out in his Gym,Showers. 9:30pm walks his dog Blue in the New York Wilson Park,10:30am Heads to his first store over looks the store makes sure everything is fine. 11:00am visits his second store checks everything is in order.11:30am goes to a local cafe where they serve gorgouse Coffy and the best croissant's, 12:30pm shop, 2:00pm Head home 3:00pm-7:00pm Design, 7:00pm Free time. Ellie Chevrolet a Young photographer who works for Designer magazines in France Ellie was brought back to New York her place of birth Because of the late passing of her father Lesson Chevrolet and Mother Laurine Chevrolet who had passed away in a Trafic accident 2 months ago, her gold lined memories swept her to New York Wilson Park She catched the subway to New York then a Cab to the Park she payed the Driver and stepped out of the cab,(9:10pm) She turned around her eyes steered her to the Bronze OverHead Entrance Sign (Welcome To Wilson's Park) her mind floaded with past memories of when she stood there when she was 13 Years old holding the hands of her Father and Mother, She smiled holding back the tears as people walk by, she wonders into the park leading her deep into the park's beauty At any moment today The flowers are to bloom as spring begins, she walks along the path, she stops. she looks into the open green grass where a family where playing the perrents where sitting on a red sqaured blanket there daughter Flying a Red kite, emotions got the better of her she shared a tear flash back of her and her perrents when she to did the same as the young family does today. she looks at the path breaths deeply wipes the tear and continues to walk, to walk to a bench to anyone else other than her it's a ordinary bench to her the most priceless bench in this world, She approached the bench she put her hand on the back board wiped away some leafes and sits. 12:30pm Ellie reaches into her cardigen pulls out 2 photos of her dad and mom she puts her bag on her lap reaches in and pulls out 1 helium balloon with a string at the end, she picks up a yellow tulip from beside her and ties the tulip on to the balloon she sticks both photo's onto the Red Balloon with a small note on it. © Copyright 2019 W.S. All rights reserved.